"41MR12, Burial II, 80" by Timothy K. Perttula and Robert Z. Selden Jr.
DECORATION: The pendant triangle motif is repeated four times around the circumference of the vessel. The central element in the motif is an engraved circle or button with an excised diamond-shaped area at the central part of the circle or button. 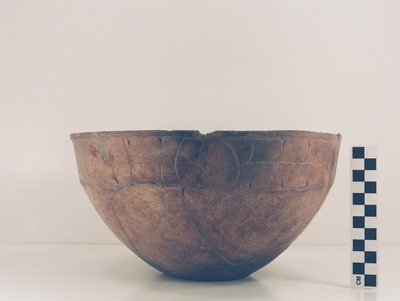 Ripley Engraved carinated bowl (MR12-80) from Burial II at the Ben McKinney site.